Home » Blog » Spring Bike Club graduates are out in the world! Meet Alex and Fatuma, new grads! Spring Bike Club graduates are out in the world! Meet Alex and Fatuma, new grads! 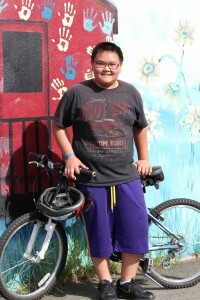 Alex, 6th grade, with his new bike on the second-to-last day of Bike Club. 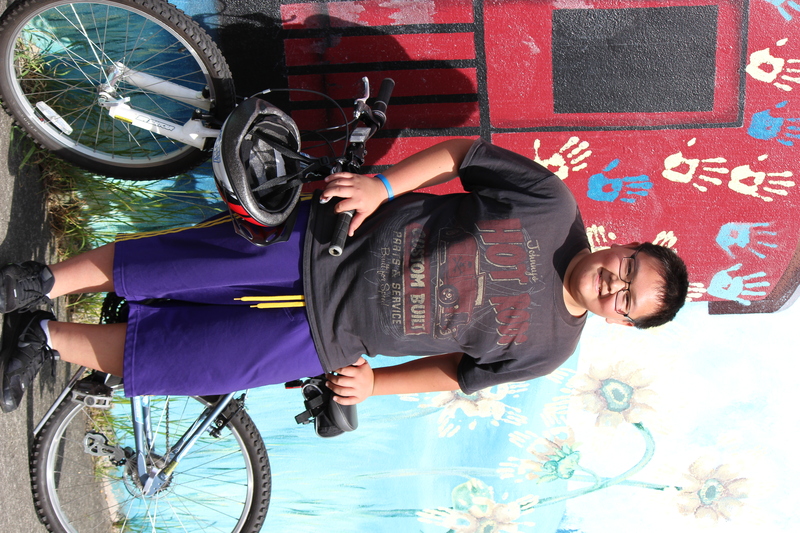 School is almost out—and so is Bike Club! 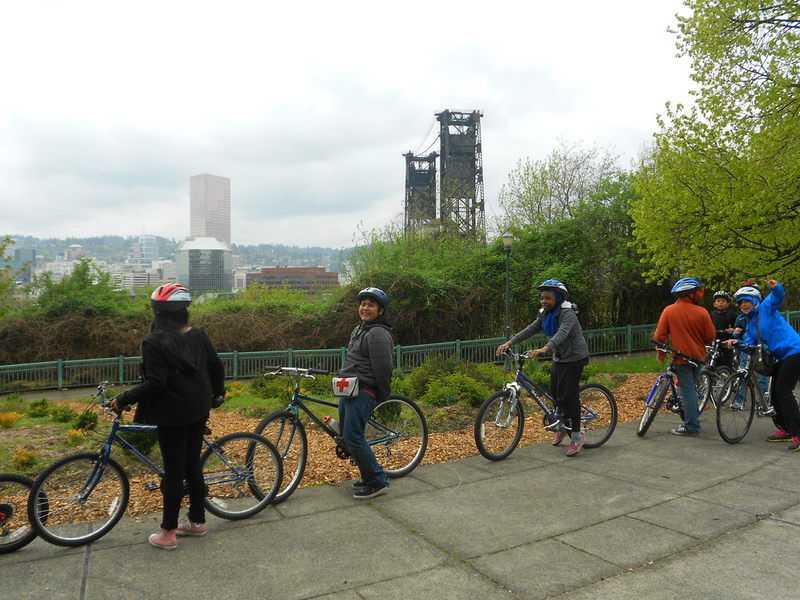 Middle school students who joined our after-school, bike safety program in the Portland area are nearly finished with the spring six-week program. They are getting ready to teach their friends and family all about bicycles and ride off with their newly earned bikes. At the end of the six-week season, all participants will earn a bike of their own, a helmet, a bike lock and a bicycle repair kit. Over the course of the program, students learned about bike safety and repair, maintenance, how to pick a bike, good habits and skills and problem solving. Some students even learned how to ride a bike for the first time. Alex Thenglao was one of those students. He and his fellow Cesar Chavez Bike Club peer, Fatuma Osman, spoke to us about their experience in the program and their new bikes. Fatuma: Yeah. It has my favorite color on it. Purple, and it’s my size. I love riding my bike because it’s just fun riding. My dream bike would be a bike that fits me and that has my favorite color, and that has a design, like flowers, and a basket to hold your stuff. Alex: Yeah, because in the past, I didn’t know how to ride a bike, and my family made fun of me about it. Then, when I told them that I learned how to ride a bike, they didn’t believe me. So, I’m going to get my bike and show them that I can ride a bike. What do you think about Bike Club? Fatuma: The group is fun and funny and nice. It’s nice, and there are people that help you there. Alex: Being in Bike Club in an opportunity to have my own bike. Riding in a bigger group, it’s safer. Your friends can help you be aware of your surroundings. If there’s a pothole or some glass, there’ll be people there to warn you if you don’t know. Do you think learning about the safety in riding is important? Alex: Yes, because without the learning safety from Bike Club, you wouldn’t be able to learn the important necessities of being safe on the road. Fatuma: Yeah, I like learning about bikes. If someone stole it, you can lock it better. Fatuma: To places, to the park. My favorite place I’ve been to is a park. I can’t remember the name of it. We played and rode our bikes and talked about our bikes. The wheel and the safety check and hand signals. What are you going to do with your new bike after Bike Club is over? Alex: Probably ride it until I get tired of it. I’ll probably still use it. I’ll definitely still ride with my friends. That’s important. I’m excited to bike with my family because we’ve never been on a family bike ride. We’ve only been to some certain places together and all of us aren’t always home. Fatuma: I’m going to ride it, ride with my friends and my cousins, ride it to places. Alex: Bikes are important because they help the environment. They don’t use up gas, like cars do, and you don’t need insurance and to pay bills like to keep your car. Fatuma: They take you places. You don’t need to pay gas and you don’t have to run or walk to get there. You have a bike. You just have to pedal there. You exercise, and they bring people together. What can you use a bike for? Alex: Travelling, like to get somewhere, not walking and taking a car. Instead of a car or a bus, you can just ride your bike to places that are near. That’s what people should know. Fatuma: If they’re going places, they can take their bikes instead of their car. Taking a bike is more fun, besides. What do you want people to know about bikes? Alex: They don’t use up oil, so people don’t have to drill for oil from the environment. The less CO2 we use, the less oil spills we’ll have. Fatuma: More people should bike. It gets you places easier and you get exercise. You don’t have to think about anything. You can just ride your bike. It takes you places. What do you like most about being a leader in your Bike Club? Alex: Hmmm…what do I like most…I like being a leader in Bike Club because it gives me a chance to show them there are right ways to not misuse your bike, like spray paint it or go do something really bad.